Saul, having failed as ancient Israel’s first monarch, finds himself rejected by God. When he realizes that the young and highly esteemed David is to be his successor, he embarks on a campaign to have the future king killed. With God’s rejection of Saul as king, it was time for Samuel to confirm his replacement. The prophet was told by God to go to Bethlehem and anoint a son of Jesse. Fearing Saul’s anger, Samuel protested, but God told him to invite the family of Jesse to make an offering by sacrificing a heifer. Samuel’s inclination when he saw the eldest and presumably tallest son, Eliab (1 Samuel 16:6; 1 Chronicles 2:13), was to select him as future king. But this time God did not choose the tallest son as He had with Saul. Instead He directed the prophet to the youngest (perhaps smallest) and most unlikely: David. “For the Lord does not see as man sees; for man looks at the outward appearance, but the Lord looks at the heart” (1 Samuel 16:7). This matter of a repentant heart despite human weakness would become an important element in David’s success. Having rejected seven sons of Jesse, God directed Samuel to anoint the good-looking David in front of his brothers. Filled with God’s Spirit from that day on (verse 13), David would have to wait on God for the fulfillment of His selection of the future king. The remainder of the book, chapters 17–31, focus on the development of David until Saul’s death. Immediately after God’s Spirit came upon David, it left Saul and he was then troubled by a different spirit. To calm his mind, his servants sought out someone who could play the lyre or harp. This turned out to be David, whose musical skill did bring peace to the king’s mind when he was mentally distressed. At the same time, Saul made the young man his armorbearer (16:14–23), giving David the opportunity to observe kingship at close quarters. The next event in the development of David’s future kingly role is the famous encounter with the Philistine giant Goliath (chapter 17). Of great significance is the expression of David’s faith in the God of Israel, whom the ca. 9-foot-9-inch (nearly 3 meters) Philistine had challenged. Refusing the armor offered by Saul, David decapitated Goliath with the giant’s own massive sword, having first felled him with a single stone from a slingshot. This defeat put the Philistines to flight, pursued by the Israelites to their cities of Gath and Ekron on opposite sides of the coastal plain. One result of David’s prowess was his close friendship with Saul’s son Jonathan (18:1–4). Another was his appointment by Saul over the king’s warriors. David’s growing popularity, however, was to become an irritant to Saul, who soon began to eye him with jealousy and suspicion, fearing that he might take the kingdom away. Under the influence of the distressing spirit, Saul twice threw a spear at David while he was playing for him. The young man escaped, but things had taken a bad turn and would only get worse. Saul now removed David from the court and made him a captain over a thousand men. David’s wise handling of the situation made the king even more wary of him (verses 5–15). Saul hatched a plan to get David killed. He would give David his daughter Merab in marriage in return for loyalty against the Philistines on the front line of the battlefield. Saul hoped his enemies would kill David. When this plan failed because Merab became the wife of another, Saul offered him his second daughter, Michal, hoping that involvement with her would bring about his death at the hand of the Philistines. Requiring no dowry of David but instead the death of one hundred Philistines, Saul set the trap for David. But the young man defeated the Philistines as required and married Michal, who loved David. This outcome and David’s increasing fame only made Saul even more envious of him: “So Saul became David’s enemy continually” (verses 17–29). The escalation of his father’s animosity toward his close friend caused Jonathan to warn David several times of the danger he faced. Even his sister, Michal, was willing to help David escape another of her father’s attempts to seize him and kill him. Each time David was able to escape, on one occasion taking refuge with the prophet Samuel and telling him all that Saul had done (chapter 19). Finally David had to flee from Saul altogether, but not without further confirmation from Jonathan that indeed the king would not relent of his enmity. This came in the form of a secretly arranged signal. Having established a covenant of peace between them, Jonathan proposed to shoot three arrows into a field where David would lie hidden. Depending on where the arrows landed David would know whether he was safe or whether he should flee. The arrows landed beyond David, and Jonathan called to his unsuspecting servant to pick them up: “Make haste, hurry, do not delay!” David knew that he must now flee from the king’s presence permanently (20:20–22; 35–39). David’s flight took him first to the priestly city of Nob, where the priest Ahimelech gave him food in the form of “showbread,” set apart for holy use in the worship of God. At David’s request he also gave him a weapon since he had none. Ironically, it happened that the only one available was the original sword of Goliath that had been kept at Nob. Traveling on to Philistine Gath, David was recognized and protected himself from his enemies by feigning madness (chapter 21). From there he went into the wilderness and took up quarters in the cave of Adullam. When his family heard of this they joined him there, but so did “everyone who was in distress, everyone who was in debt, and everyone who was discontented. . . . So he became captain over them. And there were about four hundred men with him” (22:1–2). Seeking protection for his family, David went on to Moab where the king agreed to shield his parents for a time. A message from the prophet Gad convinced David to return to Judah, where Saul soon heard of his coming. Fearing that David would attract more men around him, the king accused his own men of treachery. At that moment Doeg the Edomite, who had been present in Nob when David was there, told Saul that the priests had helped David. The king called in Ahimelech, accusing him of conspiracy. Despite the priest’s protestations that he knew nothing of David’s flight, the king ordered the execution of all the priests at Nob. Saul’s guard refused to kill the men, but Doeg ruthlessly carried out the sentence, executing 85 of them, as well as the women and children and all their livestock. A single son of Ahimelech, Abiathar, survived, escaping to David for refuge. David welcomed him, promising to protect him (verses 3–23). Saul continued to pursue David from time to time, sometimes following the lead of local people keen to betray him, but he was never able to capture him (chapter 23). While David was hiding out at En Gedi in the wilderness by the Dead Sea, Saul came hunting for him with 3,000 men. When Saul went to relieve himself in a cave where David and his men were hiding, it seemed like the perfect opportunity to end the problem of Saul. After all, David was already anointed king and his men were now encouraging him to take matters into his own hands: “This is the day of which the Lord said to you, ‘Behold, I will deliver your enemy into your hand, that you may do to him as it seems good to you’” (24:1–4). David went so far as to cut a piece from Saul’s robe, unbeknownst to the king, but was overcome with guilt and could not kill him. Once Saul left the cave, David called after him, holding up the piece of cloth to show that he had spared the king. It was a simple matter for David to make the case that he was neither in rebellion against the king nor seeking to kill him. Saul’s response was both humble and accommodating: “You are more righteous than I; for you have rewarded me with good, whereas I have rewarded you with evil. . . . And now I know indeed that you shall surely be king, and that the kingdom of Israel shall be established in your hand. Therefore swear now to me by the Lord that you will not cut off my descendants after me, and that you will not destroy my name from my father’s house” (verses 17, 20–21). David willingly agreed but wisely stayed in his wilderness stronghold. At this point in the story the death of Samuel occurs (25:1). The prophet of God and judge in Israel passes from the scene before Saul’s death and David’s accession. Next comes an example of David’s aggressive nature but also his willingness to listen and be merciful. The man Nabal (Hebrew for “fool”) had herds of livestock that David and his men had protected. 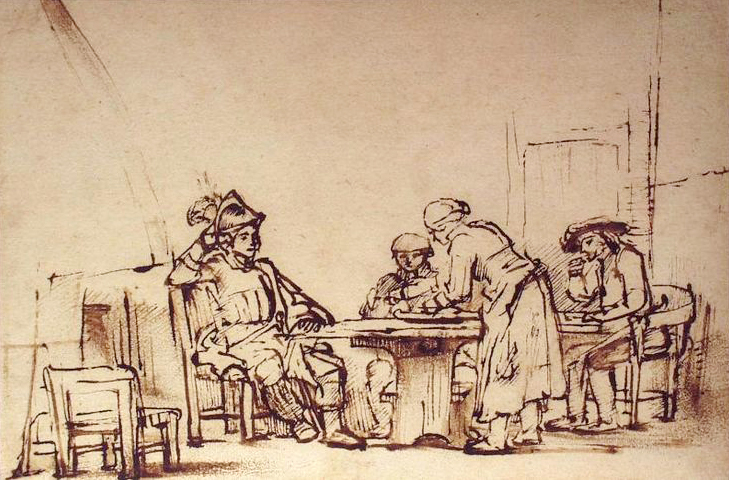 Asking a favor in return, David’s men were rebuffed by Nabal, who refused them hospitality. David’s angry response could have led to bloodshed had not Nabal’s wife, Abigail, come immediately with a plea that David would not attack her husband. 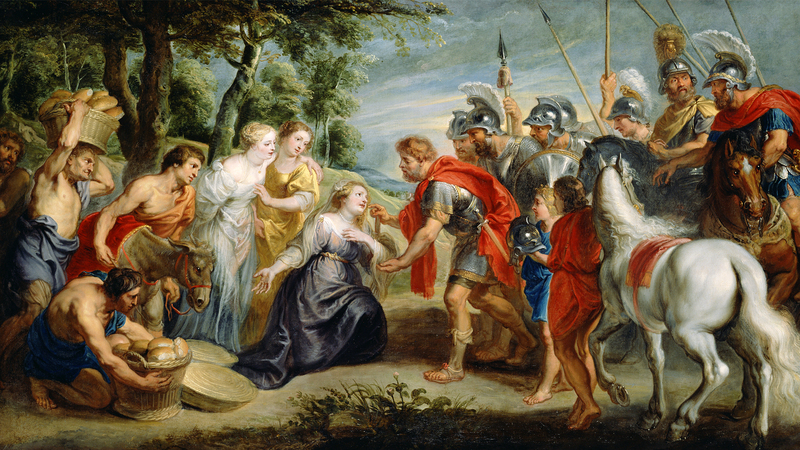 Recognizing that David was destined to become king and that Saul had come out against him, she assured David of her support and prevented him from killing her husband. David was pleased: “Go up in peace to your house. See, I have heeded your voice and respected your person” (verse 35). When Abigail returned and told Nabal what she had done, his health suffered so much that he died within 10 days, and David took his widow for his wife (verses 39–42). It is possible that David was acting as kinsman-redeemer (see Ruth 4:1–11), since later accounts record that Abigail’s only son was Chileab/Daniel by David (2 Samuel 3:3; 1 Chronicles 3:1). The book of 1 Samuel records that David also took another wife at this time, Ahinoam of Jezreel. This gave him two wives, not three, as Saul had taken David’s first wife, Michal, and given her to another man (25:43–44). David’s challenges from those who wanted to turn him over to Saul did not end. Now the Ziphites came to the king offering information about David’s whereabouts. Saul came against him with 3,000 men commanded by Abner, but David stayed hidden, only venturing out to Saul’s camp at night (26:1–5). While the king and his army slept—Saul with a spear stuck in the ground by his head and a jug of water nearby—David came with his companion Abishai. It was a tempting second opportunity to be rid of a persistent enemy. Even his colleague Abishai voiced what seemed obvious: “God has delivered your enemy into your hand this day. Now therefore, please, let me strike him at once with the spear, right to the earth; and I will not have to strike him a second time!” (verse 8). But David’s loyalty to both Saul and to God’s moral standard would not permit him to act against the king: “Do not destroy him; for who can stretch out his hand against the Lord’s anointed, and be guiltless?” (verse 9). He added that sooner or later Saul would be gone. Taking the spear and the water jug, they left until it was safe to confront Saul from a distance. David now challenged Abner for his failure to protect the king, showing the spear and the jug. At this Saul recognized David’s voice. David replied that he was of no consequence—nothing but a flea in comparison to the king. Why had he been driven out and now pursued? Saul again acknowledged his sin and asked David to come back to court. The young man simply asked that in return for not taking Saul’s life, the king would now cease his pursuit. Saul’s response was positive: “May you be blessed, my son David! You shall both do great things and also still prevail” (verse 25); but David was understandably cautious and wisely chose to avoid his nemesis, thinking in his heart, “Now I shall perish someday by the hand of Saul. There is nothing better for me than that I should speedily escape to the land of the Philistines; and Saul will despair of me, to seek me anymore in any part of Israel. So I shall escape out of his hand” (27:1). Together with 600 men and their families he went over to the territory of the Philistines at Gath to avoid further confrontation with Saul. Achish, son of the local Philistine king Maoch, agreed to give David and his men permanent residence at Ziklag. They stayed there for 16 months, though the city itself became part of Judah’s territory from that time on. To convince the Philistines of his loyalty to them, David mercilessly raided and killed many among the neighboring tribes, including the Geshurites, the Girzites and the Amalekites—ancient peoples of the region. David brought the spoils of his attacks to Achish. At this point the Philistines embarked on attacking Israel, with the assurance of David’s support (27:7­–28:2). The impending attack on Israel put Saul in a bind. During Samuel’s time the king had rid the land of spiritists and mediums and consulted with God’s servant for spiritual advice. Now that Samuel was dead, Saul attempted to contact God but received no answer through either dreams, priests or prophets. Despairing, he resorted to a medium, the so-called witch of Endor. Disguising himself, he went to her and asked that she conjure up the spirit of Samuel. During the séance, a spirit manifestation of Samuel appeared and reminded Saul that God had departed from him and foretold that he would suffer defeat at the hands of the Philistines (verses 3–19). Just as the battle was about to begin, some of the Philistines, fearing subversion, objected to David’s presence among them and told his protector Achish that his Hebrew friends should leave. David was willing to fight against Israel on behalf of the Philistines, but Achish had to heed his Philistine colleagues (chapter 29). David returned to Ziklag and found that the city had been attacked by the Amalekites and many family members taken captive, including David’s wives. So distressing was the situation that David’s own men began to turn against him. Seeking God’s help, David asked the priest Abiathar to bring the ephod, a kind of breastplate embedded with precious stones by which decisions were rendered. God’s answer was that David would succeed in restoring the families and all they had lost. Guided to the attackers by an Egyptian servant left behind by the marauding Amalekites, David was able to defeat them with only 400 men and recover all (30:1–20). Meanwhile the Philistine attack on Israel had gone as prophesied: Israel was put to flight and Saul was severely wounded, so much so that he asked his armorbearer to kill him. At the man’s refusal through fear, Saul fell on his own sword. His servant then committed suicide himself. At the same time, Saul’s three sons were killed in battle. The Philistines took Saul’s body, beheaded it, and fastened it along with those of his sons to the walls of nearby Beth Shan. So it was that Saul came to an ignominious end (chapter 31). David would mourn Saul and Jonathan once he heard what had happened. Though his path to the monarchy was now cleared, he took no delight in the death of his former mentor: “How the mighty have fallen!” (2 Samuel 1:27). We’ll pick up the account of David’s assumption of the kingship of Judah in The Law, the Prophets and the Writings, Part 18. Robert Alter, The David Story: A Translation With Commentary of 1 and 2 Samuel (1999). Robert D. Bergen, The New American Commentary, Vol. 7: 1, 2 Samuel (1996). Ralph W. Klein, Word Biblical Commentary, Vol. 10: 1 Samuel (1998).